Since the formation of continents, land elevations everywhere have been continually changing due to plate tectonics, weathering, sedimentation, etc. The total volume of ocean water has been essentially the same since formation in the early Hadean. So is the rise and fall of sea level derived from the geological record measured relative to the adjacent land, or the center of the earth, or what? Short answer: Nobody knows. Estimates of post-cambrian water levels are done by studying geology and where shorelines were in the past and what land was under water and working out from that how high the sea level probably was. There are no pre-cambrian sea level estimates that I know of. Working out how much water was on the surface of the Earth, especially during the pre-Cambrian era is a difficult subject with much uncertainty. While the total amount of water on Earth may not have changed too much too much over the last 3 billion years, ground water vs surface water, and the shape of the ocean basin and the role of volcanoes and tectonics add to the uncertainty. There's still some uncertainty on snowball Earth and if it went all the way down to the equator over the oceans. Sea level over the pre-cambrian requires working out the specifics of snowball earth. It's a tricky subject full of uncertainty. From what reference point/level are prehistorical (e.g., Precambrian era) sea levels estimated? I've never seen a pre-cambrian era estimate on sea level so I don't know how they are estimated. This is the oldest I could find. As the article explains, historic sea level is estimated by finding where the shorelines were at geologically historic time periods and looking at what was under water. There's probably a pretty significant margin of error in those estimates I would think. The main factors affecting sea level are the amount and volume of available water and the shape and volume of the ocean basins. The primary influences on water volume are the temperature of the seawater, which affects density, and the amounts of water retained in other reservoirs like rivers, aquifers, lakes, glaciers, polar ice caps and sea ice. Over geological timescales, changes in the shape of the oceanic basins and in land/sea distribution affect sea level. In addition to eustatic changes, local changes in sea level are caused by tectonic uplift and subsidence. Over geologic time sea level has fluctuated by hundreds of meters. Today's interglacial level is near historic highs and is 130 meters above the low level reached during the Last Glacial Maximum 19,000–20,000 years ago. So, key factors are obviously ice ages and glaciers, as well as the shape of the ocean basin. The movement of continents affects the shape and depth of the ocean basin, so continental movement likely has an effect. As a somewhat small but fun example, the Mediterranean Sea has about 3.75 million cubic km of water in it and the sea is thought to have been a dry valley some 5.33 million years ago that, once the straight of Gibraltar gave way, was quickly filled by the Atlantic ocean. That's just a theory. It may have filled much more slowly, and over 5 million years ago, it might have been a significantly different size too, but if we use the 3.75 million cubic km number over today's 361.9 million square km of ocean surface, that works out to a 10 meter drop in sea level to fill up the Mediterranean valley. 10 meters isn't a big change in the grand scheme of things, but if it happened over as little as a year, as one hypotheses suggests, that would have been quite something to observe a 10 meter drop in sea level over a single year or so. However long the Mediterranean took to fill, it's a nice example of how shifting land can affect sea level. Historic estimates are made (as noted above) by studying where the shorelines were and studying what was under water and trying to piece together an estimate from that. Formation of glaciers like the Antarctic Glacier, which would raise sea level 58 meters if it melted, affect sea level too. The antarctic glacier began to grow in earnest about 34 million years ago. Greenland is another 6 meters and that formed much later, over the last million years or so. Geological history of ice ages is fairly well understood, though the total amount of water in those glaciers might have some uncertainty. The shape of the ocean basin is (I think) less well understood over the last 600 million years or so. 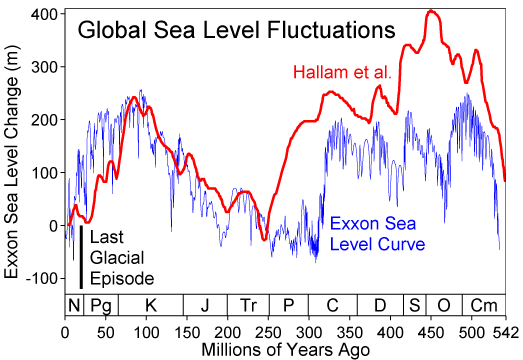 The ice age periods, 260 to 360 and 420 to 450 million years ago should correspond to drops in the chart, below. The recent ice age period is just 2.5 million years long, and too short to be well represented but the 34 million years when the antarctic ice formed is apparent. The continents formed quite early, between 2.5 and 3 billion years ago. The silicate rock that form most of the granite that makes up both the continents and the continental plates was present at the formation of the Earth. Heat and plate tectonics likely helped form the continents. Life and photosynthesis may have added to them over time, but most of the continental material was present at Earth's formation. Precisely how sea levels change, other than by formation of glaciers or the forming of filling of valleys on land is (to my knowledge) not well understood though the shape of the ocean basin (noted above) plays a key role. The continents are roughly some 35 miles thick in silicate rock, but that far below the Earth's surface, silicate rock can melt and mix with basalt in the upper mantle. We know this because lava can be either basalt rich or silicate rich. Wikipedia mentions sediment and groundwater likely also play roles. Over long enough periods of time, the rock cycle likely returns sediment that erodes of land into the ocean, back to the land. Likewise, life can lead to the formation of limestone and other carbonate rock, but that's probably a small percentage of total land and a small factor, not a major factor. The internal heat of the Earth (I would guess) play a bigger role. A hotter earth, the upper mantle is a little closer to the surface and the granite continents and continental plates are less thick, so they float less high on the basalt, leading to a corresponding higher sea level, but that's just speculation on my part. As Earth cools over hundreds of millions of years, the granite may become thicker and the sea level could drop in relation to the rising land. This fits with the studies that sea level was generally higher in the past, but, again, this is speculation on my part. You probably shouldn't make that assumption. The Hadean was the first epoch all the way back to the formation of the Earth. For consistent amounts of water, the earliest I would consider starting would be the end of the late heavy bombardment, about 3.8 billion years ago. That would be enough time for the magnetic field to form (about 4 billion years ago) and time for the sun to settle down, because UV rays from the young sun can strip water form Earth by photo-chemical dissociation. Throughout the history of Earth, UV rays from the sun have stripped hydrogen from atmospheric water vapor, effectively taking water away from Earth and replacing it with hydroxide, which is fairly reactive. Likewise, comets and asteroids that hit the Earth bring water with them. The current rate is quite small and insignificant, but 3.8 billion years ago, even after the late heavy bombardment, there might still have been frequent enough comet impacts to affect sea level over different eras. Precise numbers aren't known - question on that here. But if Earth loses 50,000 tons of mass per year, most of that hydrogen stripped from water, that's as much as 900,000 tons of water photo-disintegrated per year. Over a billion years, that's 900 trillion tons of water, which sounds like a lot, but it's less than 1/10th of 1% of our ocean's mass of about 1.5 million trillion tons. That said, when the Earth was hotter when it was young, it could have had more water in it's upper atmosphere and lost more water than 0.1% per billion years. This estimate suggests that the Earth lost as much as 25% of it's water over the last 3.8 billion years based on studying deuterium ratio in 3.8 million year old rocks to water on Earth today. There's also the problem of water emerging from inside the Earth. It was recently discovered that the lower mantle is wet and there's as much water deep inside the Earth as there is in the oceans, maybe more. How much mantle water made it's way to the surface of the Earth during the pre-cambrian era is unknown. Some of Earth's water today likely came from inside, even though the heat of formation of the planet probably lost most of it, some (at least an ocean's worth) is still deep inside the Earth but much (most?) is thought to have come from comets and meteors during the late heavy bombardment. Speaking strictly for the geological record, it's not directly measured, but estimated by the methods discussed above, looking at geological records of old shorelines and land that was once under water and working out an estimate. Sea level from the center of the Earth is mostly done for modern measurements. You can measure sea level against the land, but land can rise and fall, or it can be measured from the center of the Earth, independent of land shifting. I don't think that's particularly relevant to your question on geological estimates of sea level. That probably needs some cleaning up, but it's a fun subject. I thought I'd give it a shot. First there are many ways of estimating sea level, you will have to examine a specific paper to see what they use. As a rule of thumb global sea level is usually measured relative to current sea level in paleoclimate studies this is confusingly an absolute measure, usually eustatic (volume of the ocean water). Keep in mind sea level is different across the planet's surface when measured from the center of the planet thanks to spin and gravity anomalies so there is no absolute measure of height, so instead volume is used. There are of course many relative measures of sea level but this is more referring to sea depth than anything else and thus are local effects. Second if you haven't guessed, the volume of the ocean is not constant it changes quite a bit, both the volume of the water and the volume being occupied, the volume of the container if you will. The mass is more constant (on the scale being measured) but even then influenced by removing or adding water. Many measures of sea level are eustatic, meaning they are measuring change in the volume of the ocean. On the global level there are two big issues influencing sea level, temperature and available water(mostly ice caps). The temprature has a big effect due to thermal expansion, change the temprature and the volume of water changes even if the mass is the same. Most of the our current sea level rise is due to thermal expansion not melting glaciers. The second is if there are ice caps and how big they are, since ice frozen on land is not in the ocean. The earth right now basically has only one ice cap (antarctica). Icecaps are largely controlled by whether their are continents near the poles. Isolated dry basins that flood can have a similar effect by increasing the area that needs to be filled, for instance when the mediterranean flooded it is estimated to have dropped global sea level (of the rest of the ocean) by ~ 9 meters in a about a year or two, which may be one of the most dramatic change in history, and probably scared the crap out of the humans around at the time. The drop is caused by increasing the volume being filled without changing the volume of water. There are lots of smaller and/or local effects that can change sea level or local sea level and wiki has a decent chart of them here, these include age of the oceanic plates, plate rebound, and intercontinental reservoirs. Not the answer you're looking for? Browse other questions tagged sea-level or ask your own question. Water levels: What does “mBf” mean? How were the sea levels around western Europe during the Medieval Warm Period? Coral growth keeping up with sea level rise? If all the world's ice were to melt, would this shift the earth's centre of gravity with consequential effects on sea levels?